Stir-frying is one of the most popular methods to cook beef in Vietnam. We stir fry beef with all kinds of vegetables such as broccoli, kohlrabi, leeks, celery leaves, potatoes etc. 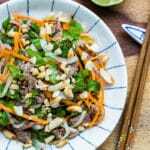 Stir fried beef is usually quick to cook, so I think that’s why it’s popular in Vietnam where both parents work from 8 a.m. – 5 p.m and a quick and hot dish for dinner is desirable. The secrets to juicy and tender stir fried beef are thin slices against the grain, hot pan, not overcrowding the pan and working quickly. 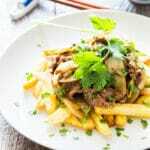 My favorite cut of beef for stir frying is flank steak which is easy to slice, very flavorful and tender when cooked right with a little bit of a pleasantly chewy texture. If you want something completely tender, you can try beef sirloin. I found out that you should not marinate beef with fish sauce because the meat will become sour and tough, so please add fish sauce during cooking. The pan should be hot and you should only add enough beef to cover the pan in one layer. If the pan is not hot enough or if you overcrowd the pan, you will steam the beef and it will lose all the juice and become tough and dry. If you need to stir fry a lot of beef, cook in small batches. It’s also important not to overcook to avoid tough and dry beef. 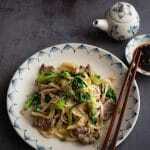 Stir frying beef doesn’t take long at all, just a few minutes. 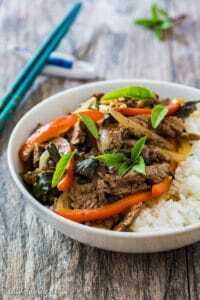 A few years ago when I studied in London, my housemate once made stir fried beef with red bell peppers and Thai basil for dinner and I really liked it. When I tested this recipe to share on my blog, I added onions to one batch and I liked it even more. 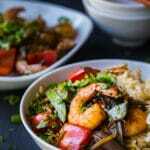 The crispiness and sweetness of red bell peppers and onions together with the aromas of the basil make this dish very flavorful and interesting. This dish is not only packed with flavors, it’s full of nutrients as well. I hope you like this dish as much as I do. Whenever I cook it, it reminds me of my time studying in London which changed my thinking and perspective a lot. 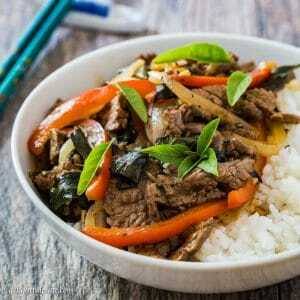 A quick stir fried beef dish with the aromas no one can resist. Thinly slice the beef against the grain and marinate beef with oyster sauce, dark soy sauce, salt, pepper, garlic and 2 teaspoons of olive oil for 5-10 minutes. 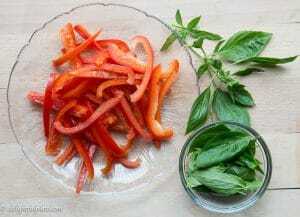 Cut the red bell pepper in half length-wise, remove all the seeds and slice into 0.25'' thick strips. Trim off the top and bottom of the onion, peel off the skin, cut into half length-wise and slice thinly. Wash and pat dry Thai basil, discard all the stems. We only use the leaves in this recipe. Put a pan on the stove on medium high heat. When it's hot enough, add olive oil to the pan, then add red bell pepper strips and onion half rings. Saute bell pepper and onion for about 2 minutes, stirring frequently then add a pinch of salt and pepper. Saute for another minute until bell pepper is quite tender and onion has developed colors. Transfer both to a bowl, set aside. Increase the heat to medium high-high, wait about 30 seconds for the pan to be hot enough and add the beef in one layer. Leave the beef on the pan undisturbed for 30 seconds and then start stir frying. 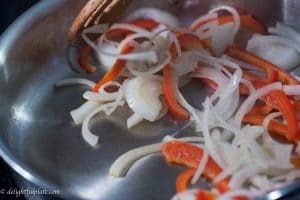 After the beef has been 75% cooked (this shouldn't take long, probably just another minute), add bell pepper and onion back to the pan, add fish sauce, soy sauce, adjust seasoning to your liking and stir fry everything together until beef is fully cooked. Again, this shouldn't take long at all, a minute or so. Turn off the heat, remove the pan from the hot stove and add basil to the pan. Quickly mix the basil into the dish and then transfer immediately to a clean plate.